The NCERT history textbooks "Our Pasts" has been in effect for nearly 8 years now and it continues to be seen by many as best possible history textbook for school students written in post independent India. These particular set of textbooks from middle school (class VI) and above, themselves emerged in the context of the criticism of 'saffronization', that the preceding set of NCERT history textbooks, produced under the aegis of the then NDA government (in governance from 1998-2004) were seen to 'suffer' from. However, not many have seen how and to what extent these pious objectives were actually carried out in the history classrooms. It is of course needless to say that mere refashioning of textbooks alone cannot impact pedagogy in ways that are child centric and constructivist. I personally as a teacher of history faced numerous issues while reading the textbook and attempting to fashion a class accordingly. To illustrate this point I just take up one of the chapters from its class VII textbook, which is its first chapter - Tracing change a thousand years. As I understand it, this is an introductory chapter to the kind of themes, issues, features that the remainder of the book deals with and is hence to provide a birds eye view of the entire textbook . In effect this class VII textbook deals with the period from 700 to 1700 CE which is often characterized as medieval period. The division of our past(s) into ancient, medieval and modern is not as simplistic or arbitrary as it may seem but is meant to represent time in terms of certain broad and generalizable characteristics specific to its polity, economy and society. Needless to say the duration of each of these epochs varied across different geographies. Now the chapter as such does not state this important point as much in its beginning and only towards the end of the chapter. Personally I found it perplexing to move this important aspect in the chapters conclusion which by rights should have been the first important point to consider. After all concept of time is so determining of history. The teacher no doubt is at liberty to bring forth this part right at the chapters commencement. As we have matters, linearity is so embedded in our understanding - of change and unfolding of events and of causality transpiring in certain sequentiality - highlighting this aspect from the chapter would be pivotal in my view. Unless brought about by the teacher through her own ingenuity, it is quite possible that this key learning - that period before medieval and after, are characterized and distinguished by certain socio-economic and cultural features (if not political), may be lost. The point that monikers like ancient, medieval and modern are not to be confused with certain values that these terms may invoke is well made, albeit a bit too late into the chapter. Secondly the idea to suggest medieval period commencing from 700 CE and not from say 500 CE itself when we had the reign of Pallavas, Chalukyas, Harsha, which have been discussed in class VI textbook, is bit puzzling to me. Surely the system of land grants, samantas, dominance of Brahmin priests, temple building etc were as much part of Pallava or Chalukya history, pre 700 CE as they were of Cholas or Rashtrakutas post 700 CE. 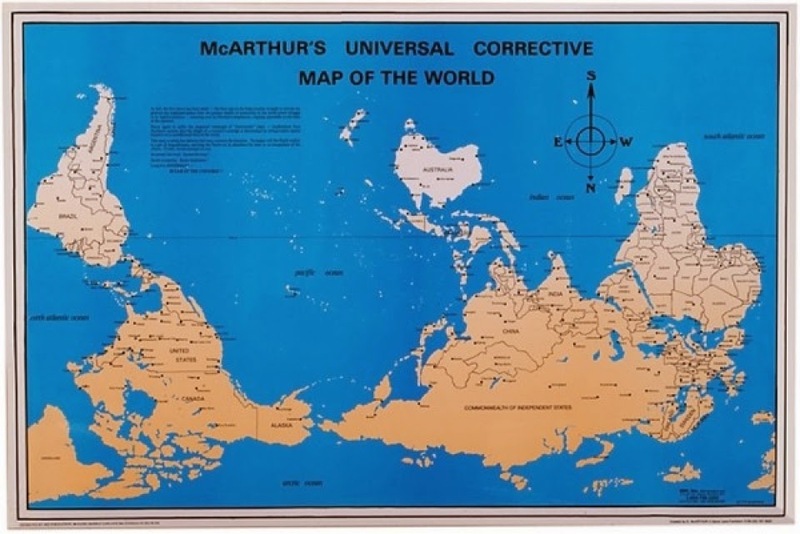 which re-envisions the world today to suggest that the north-south, east-west axis is not a given and can be suitably inverted. (2) Such inversion, greatly alters our understanding of current geography and indeed contemporary geo-politics which can be seen to have its roots in some kind of ethnocentrism. The textbook then makes the observation that , "[...]When historians read documents, maps and texts from the past they have to be sensitive to the different historical backgrounds – the contexts – in which information about the past was produced." By using maps as example to highlight this point, I felt that the chapter was asking the teachers to make a greater reach. It is more on the teachers to underline this insight that accounts - manuscripts, inscriptions, coins and monuments constituting the sources to study a particular period have to be viewed in terms of the cultures and times from which it emerges and more importantly understanding the knowledge systems and world view that embed such sources. Therefore terms and words which have specific meanings today could have had different meanings in the past. The chapter gives an example earlier on itself before making this point - Take the term “Hindustan”, for example. Today we understand it as “India”, the modern nation state. When the term was used in the thirteenth century by Minhaj-i-Siraj, a chronicler who wrote in Persian, he meant the areas of Punjab, Haryana and the lands between the Ganga and Yamuna. He used the term in a political sense for lands that were a part of the dominions of the Delhi Sultan. The areas included in this term shifted with the extent of the Sultanate but the term never included south India within it. By contrast, in the early sixteenth century Babur used Hindustan to describe the geography, the fauna and the culture of the inhabitants of the subcontinent. As we will see later in the chapter, this was somewhat similar to the way the fourteenth-century poet Amir Khusrau used the word “Hind”. While the idea of a geographical and cultural entity like “India” did exist, the term Hindustan did not carry the political and national meanings which we associate with it today. Historians have to be careful about the terms they use because they meant different things in the past." It goes to explain further that notion of a foreigner is different from the notion of a foreigner we have today. It is evident that the textbook writers are basically trying to underscore the nuanced point that the Delhi Sultans and Mughals, are not be seen as rule by 'outsiders' and their rule over much of India as religious or Islamic rule. But historically in periods before medieval itself ( i.e. before 500 CE), we had the instances of Parthians, Kushanas, Scythians, the Indo-Greeks whose conquest of India has never been much of a bother for even those who believe in Hindusthan by and for Hindus and who do not perceive these 'foreign' conquest as undermining Hinduism and Hindusthan. This is not highlighted well in this chapter. Then the text also makes the point of interpolation - "As scribes copied manuscripts, they also introduced small changes — a word here, a sentence there. These small differences grew over centuries of copying until manuscripts of the same text became substantially different from the other". Phew! This is quite a task even for a university professor dealing with sociology of knowledge!! These are no doubt very profound insights, not without certain ambiguities and to arrive at these perspectives, cannot be an easy task for teachers. So I wonder if it would not be prudent to minimize these ambiguities and such perspectives be stated in a more direct manner rather than leaving it to the ingenuity of teachers. Fourthly the sub-section on emergence of new groups and religions, does not elucidate with much clarity, how the new social or ethnic groups morphed into caste groups and how many ruling dynasties themselves emerged from social changes resulting from migrations and invasions by different ethnic groups. This aspect has been far well explained with greater detail and coherence in the Eklavya textbook of class VII and their chapters - Formation of dynasties and Suzerain and sub-ordinate kings - something that the next chapter in Our Pasts' New kings and kingdoms does not bring about so well. But the thing to be noted in the Eklavya textbook is the fact that they stop this period with 1200 CE and appear to suggest that Turkish/Delhi Sultanate period can be seen as a separate distinct epoch. Of course here again they do not suggest that changes were merely on account of their Islamic denomination . In my view, part of the problem with such ambiguity and confusion and even certain lack of flow and coherence is considerably due to the pain these textbook writers take to minimize and undermine the view, implicit but having a great currency amongst many, that Muslim rule was 'foreign' and Islamic rule was inherently bigoted. On the other hand attempt is made to suggest (a view more or less accepted in left-liberal academic discourse on medieval Indian history as a truism) what the Muslim monarchs did either in terms of socio-economic and religious policies were already transpiring in the Indian sub-continent. In other words there was a continuum in Indian past and mere conquests by people across the Indian frontiers of different ethnic and religious stock did not fundamentally alter the continuum. While there were undoubtedly changes, they were not so staggering as proponents of 'Hindutva' history may have it. This NCERT textbooks is thereby 'secular'. Recently I was involved in some research on teacher mediations of textbooks where I looked at select school teachers and the way they were enabling this textbook pedagogically. One impression I overwhelmingly got was how such nuances and subtler insights were often lost on the teachers. Instead of trying to build their own narrative based on the textual matter, more often the teachers were going 'totally by the book' - breaking the text into discrete and disembodied fragments of 'knowledge'. Since the textbook itself lacked lucidity, such significant matters were not adequately articulated and debated. While many of these teachers were well meaning and even well qualified, most of them were unable to cohere matters in ways which facilitated the enabling of broader perspectives and insights. And from my own attempts to enable not just this chapter but a few more from the NCERT's Our Pasts, I often found myself at my wits end in bringing certain clarity and coherence, without completely ignoring the textbook or at least making it marginal to my teaching efforts. The crux of matter is many scholars feel one cannot allow everyone to evolve their own reading of pasts, for study of history is a delicate and difficult task involving careful reading of sources and using certain sociological, economic and political frameworks. Often we peddle many half truths, myths, beliefs and fancies that take centre stage in a more 'commonsensical' approach. But then scholars also talk about learning to be constructivist and knowledge itself emerging through social prisms. One then supposes that in such a sense textbooks, curricular guidelines have to strike a balance and provide some form of a scaffold for an engaging and reflective pedagogy. However I find the current NCERT textbooks failing to strike a balance, leaving teachers confused and bewildered. Students too were experiencing considerable difficulty in relating to the different aspects and learning outcomes that these chapters intended. These textbooks and the ideas embedding it calls for certain kind of diligence on part of both teachers and students, for which greater expanse of time, domain exposure and curriculum flexibility is needed, something that few schools provide for, bogged down as most of its members are by 'performative' anxieties. In such a scenario then I could not help wondering if the textbooks could not have been more pointed. Also I cannot but see the textbook tying itself into knots in seeking to build a 'secular' narrative. Of course by making this suggestion I do realize that the textbook would then remain inert and come in the way of the challenge and excitement that a 'constructivist' or a scaffolded learning facilitates. * However given what I personally experienced, based both on my teaching and what I observed of other teachers, I seriously wonder what concrete purpose is being served by making the lessons far too abstract and yet expecting both students and teachers to bring in critical reflectivity, historical thinking on one hand but on the other hand their social experience with its embedded empiricism, implicit discourses of power, ethnocentrism, gender and cultural bias, into play. This kind of social criticality is a new discourse that only disciplines in social science and languages brings to fore. Such a view of social sciences again is limited and yet to obtain much traction. Therefore under such circumstances not just more conceptual and thematic clarity needs to be well put across in textbooks but its pedagogy too should be specifically and concretely charted out. * In this connection, one should acknowledge the existence of textbooks by private publishers which too follow the syllabus and curricular guidelines outlined by National Curriculum Framework 2005 and NCERT and on the face of it can be seen to deal with the issues of flow and clarity that I'm talking about. This actually needs a detailed and a separate study but it will however suffice to say that the private textbooks in their effort to simplify and cohere matters smudge the more complex and larger aspects of political economy or social formations whose understanding can be regarded as history's core learning. Further, as I have already stated in one of my earlier postings, the CBSE too has on its part done everything to undermine more richer and complex learning by enabling assessment norms and exams that is guided more by ensuring better mark/grade scores and 'de-stressing' students from the fear and burden of exams. This again needs a separate study.